The GD5 is the baby of the range with a floor area of 5 square meters and a hieght of around 2.6 meters. 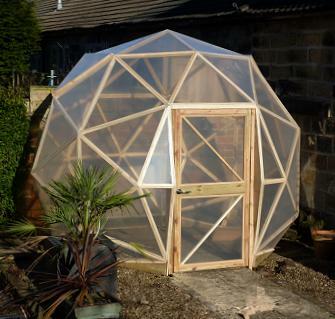 2 frequency, pressure treated softwood frame, solid 50mm base beams and quality timber door. 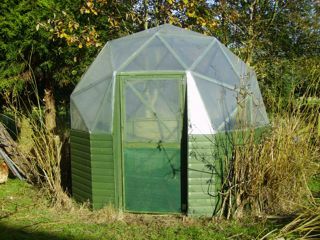 This dome is also available as a half dome to go against a wall and a solid based potting shed version as shown below. Click here for prices and options for this model. Do you have photos and information on the half dome? Pricing?